Is this bizarre creature really an alien baby or just part of an elaborate hoax - and was it the cause of a mysterious revenge death? At the end of last year the farmer, Mario Lopez, handed the corpse over to university scientists who carried out DNA tests and scans. Tests revealed a creature that is unknown to scientists - its skeleton has characteristics of a lizard, its teeth do not have any roots like humans and it can stay underwater for a long time. Its brain was huge, particularly the rear section, leading scientists to the conclusion that the odd creature was very intelligent. But it has seemingly left experts stumped. And in a further mystery, Lopez has since mysteriously died. According to American UFO expert Joshua P. Warren (32), the farmer burned to death in a parked car at the side of a road. The flames apparently had a far higher temperature than in a normal fire! Now there are rumours that the parents of the creature Lopez drowned were the ones who in turn killed him out of revenge. There are frequent UFO sightings and reports of crop circles in the area where the creature was found. Perhaps it was left behind deliberately by aliens. Mexican UFO expert Jaime Maussan (56) was the first to break the story. He claimed it was not a hoax. Farmers also told him that there was a second creature but it ran away when they approached. The puzzle has caused intrigue amongst BILD’s readers. 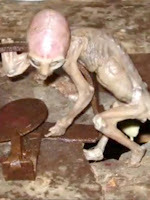 Some say it is a mutant, others wonder why aliens would leave a baby behind - and one reader asked why aliens don’t wear clothes. And the bizarre story has reached as far as South Korea and China! Mexico isn't the only hotspot of apparent extra-terrestrial activity, either - Germany has had 366 UFO sightings this year!